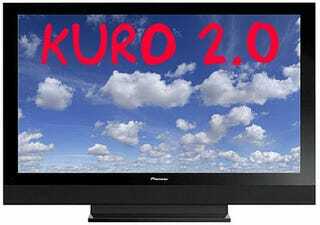 We can't totally figure this out, but we're trying: Pioneer Europe just promised to ship second-generation Kuro plasmas as early as June, yep TVs stated by the company to be five times better than the "best TV ever," the current Kuro plasmas. Pioneer US says that it will be announcing plasmas soon, but that its lineup will be "different" than the Euro plasma lineup seen here, understandable since these have DVB and other Eurotech not found in US TVs. KURO Plasma TVs for absolute picture quality The new 2008 range of KURO plasma TVs exceeds the boundaries of what was thought possible in picture quality performance. The second generation KURO pushes closer to absolute black by further reducing the idling luminance and improving black levels five times over the previous 2007 KURO models. This has enabled Pioneer to accurately reproduce even higher contrast levels and deeper colours within the high-definition colour spectrum. The all-new 2008 KURO plasma TVs are available in 50 and 60-inch (availability depending on region). The PDP-LX5090 and PDP-LX6090, 1080p sets at 50" and 60" sizes, are promised by June, with DVB-satellite-receiver PDP-LX5090H and PDP-LX6090H variants due in some regions later. Price is still TBD.